The Common Birdwing is one of the Troides spp that is a CITES-protected species (the genus Troides is listed in Appendix II of protected species). Although it is not rare in South East Asia, and in locations where its caterpillar host plants are cultivated, the species can actually be common, the CITES protection is probably to protect this large and showy butterfly from being traded to extinction. 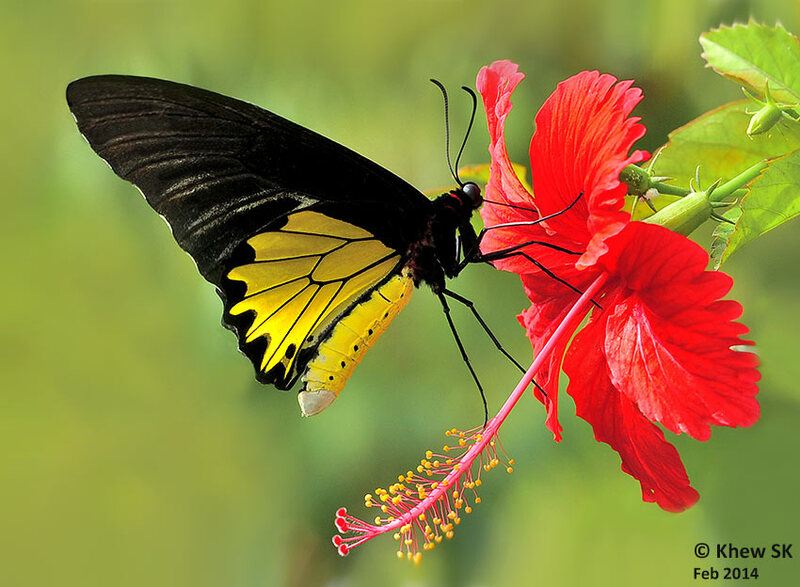 The Common Birdwing is a large and beautiful butterfly with its black and yellow wings. It is believed that the aposematic colouration is a display to predators that it is distasteful and should be avoided. Its caterpillar host plant is Aristolochia acuminata which this species shares with the Common Rose (Pachliopta aristolochiae asteris). Here, a male Common Birdwing is feeding on the nectar of the Hibiscus flower.